uniform experiment's latest collaboration with Nike Sportswear is finally making it's way to select retailers. For their latest collaboration with Nike Sportswear, uniform experiment has put together this unique design of the popular All Court Mid. 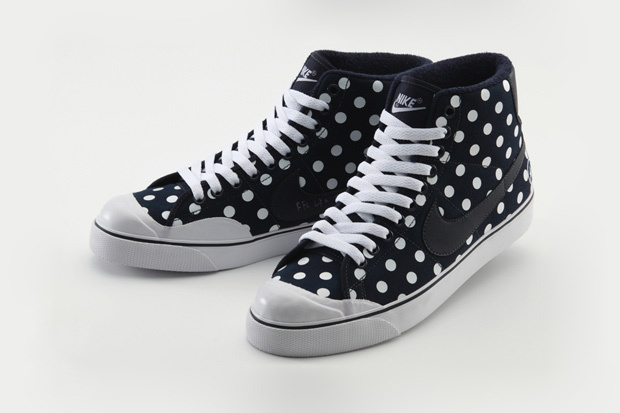 Doing justice to to the classic silhouette, uniform experiment went with a clean all-over polka dot print over a navy canvas upper. The busy design is contrasted by the white laces, and white vulcanized sole below. Releasing in limited numbers, uniform experiment's make-up of the All Court Mid will be available soon at select Nike Sportswear retailers.